While I can argue few people are better Trout Fisherman than myself, the same is not true for bass. 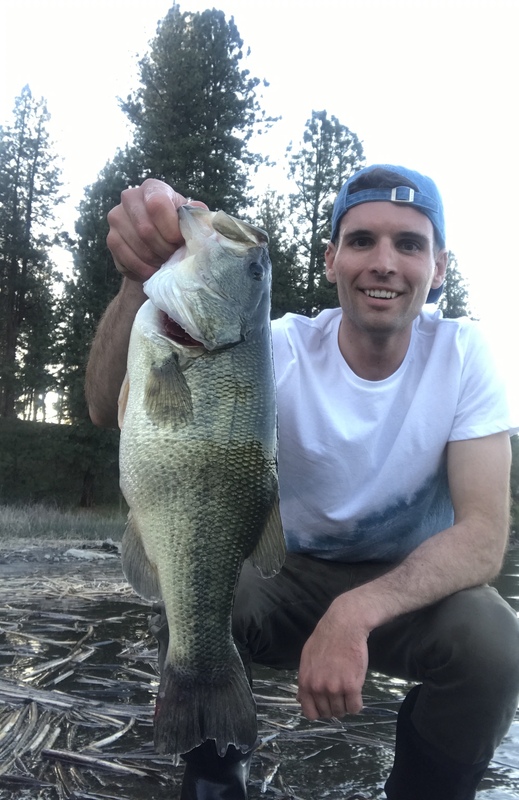 I love bass fishing, but in Oregon, it’s hard to consider yourself a serious bass fisherman just because of the limited fisheries we have here. Still, I catch a lot of bass, and I can help you do the same. This was arguably my favorite bass in recent years. It wasn’t the biggest, but this four-pounder crushed a crappie jig and put up an awesome fight on my ultralight. I’ve landed thousands of bass, with most of those being Largemouth Bass and Smallmouth Bass. There are a few Spotted Bass, Striped Bass, White Bass, and Yellow Bass mixed in. I haven’t landed my ten-pounder (apart from Stripers) yet, but it will come with time. The most serious bass fishermen keep a dozen or more specialized rods on their boat at any given time. I’m serious, but not that serious. I usually carry two rods when fishing from shore and three to five when fishing on my boat, each with a specialized purpose. My First Choice: Lews Speed Stick TP-1 IM8. Senkos, other plastics, or jigs? My First Choice: G. Loomis E6X. My First Choice: Shimano Trevala S 135. Value Pick: Ugly Stik Elite Salmon Rod. Baitcasters look cool, but they don’t add functionality to most bass fishing. For that reason, I almost exclusively use spinning reels. It’s not traditional, but why go out with a less effective setup? I mean, that’s what flyfishing is for! Use Trilene Sensation – 12 lb. Use Power Pro Super Slick – 20 or 30 lb. For leader P-Line Fluoroclear – 20 lb. Use Power Pro Super Slick – 50 lb. For leader P-Line Fluoroclear – 30 lb. Most bass fisherman lip their bass. If you do choose to use a net, try these out. Use an Ego S2 Slider 22-Inch. Use an Ego Small Rubber Landing Net. You can throw whatever you want, but more bass have been caught on 5-inch Senkos than anything else, and i’s not even close. Grab at least half a dozen colors of these. My perennial favorites are Black, Bubblegum, Cream White, Smoke, and Watermelon. Use Gary Yamamoto 5″ Senkos. Rig wacky or weedless on Gamakatsu 3/0. Some game cut a Senko in half, put it on a 1/4 Ounce jighead, and named it after himself. This is the lure that gets laughed at, but it works. Don’t waste money on Ned Plastics; instead just wait until a bass breaks your Senko in half and extend its life by using it as a Ned Rig. There is so much out there, it’s hard to list. I honestly never use lizards or crawfish, but they can be effective. Just experiment and find your “specialty” lures. If I could only use one bass lure, it would probably be these in an assortment of White, Black, Green, and Purple. Use 4.8” Keitech Swing Impact. Use VMC 1/4 or 1/2 Oz Jigheads. There are a lot out there, but it’s hard to beat the 4- or 5-inch cheap stuff. Use a WildEye Swim Shad. For river smallies, use LiveTarget Goby. My First Choice: Huddleston 8″ Rainbow Trout. Value Pick: Savage Gear 3D Real Trout. I’ve tried others, but you’re better off just having a selection of these. Don’t expect to work it for more than an hour because you’ll get tired, but I like both a smaller and larger walking bait handy. Use a smaller Zara Puppy. Use a larger Zara Super Spook. It goes without saying you need some Buzzbaits. I’ve never noticed a difference with color choice because I usually only use them in low light. Use a Large Whopper Plopper.